The timelessness of the 2017 Mercedes-Benz S-Class is evident across its six trim levels, each bringing unique styling and features to the table. From the entry-level S550 to the top-tier AMG® S65, the members of the S-Class family are sure to excite and inspire Orangeville, Halton Hills, Caledon, and Georgetown drivers. For a closer look at these remarkable Mercedes-Benz sedans’ extensive array of features, visit Mercedes-Benz of Brampton in the Greater Toronto Area! 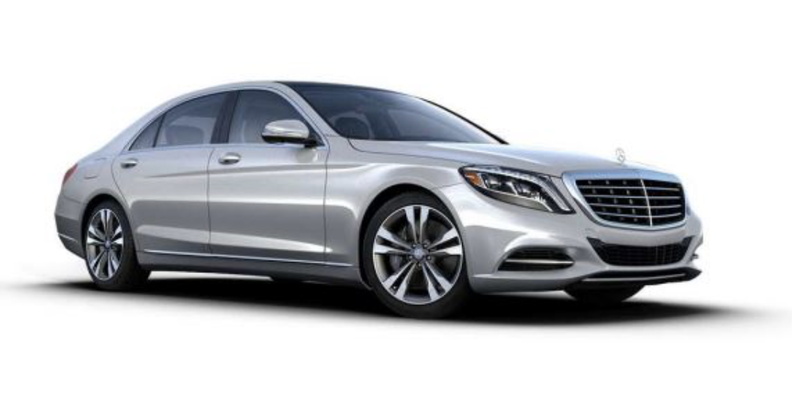 With specs ranging from 449 to 621 hp, and 516 to 738 lb.-ft. of torque, the Mercedes-Benz S-Class isn’t for the faint of heart. Each of the five engines come paired with a 7-speed automatic transmission, specially engineered for quiet performance and improved highway fuel economy. The AIRMATIC® and AMG® Adaptive Sport Suspension systems glide over rugged road conditions, particularly with 4MATIC® all-wheel drive at the helm. For even silkier handling, the Adaptive Damping System automatically chooses a damping profile for each spring-strut to accommodate the directional changes of each wheel. From soft-close doors, to KEYLESS START®, to a cabin fragrance system, the panache of the S-Class seemingly knows no bounds. The cabin comes lined with authentic wood trim, hand-tailored leather upholstery, and aluminum accents, as well as a wood/leather multi-function steering-wheel and a panorama roof. In the cockpit, you’ll find power-adjustable front seats with a heating function, ideal for chilly Greater Toronto Area weather. Dual-zone automatic climate control features separate left and right temperature settings, while the cabin-air purification system uses dual charcoal filters and an ionizer to emit the soothing scent of petrichor. Teeming with advanced technology, the Mercedes-Benz S-Class sets the bar for convenience and entertainment. 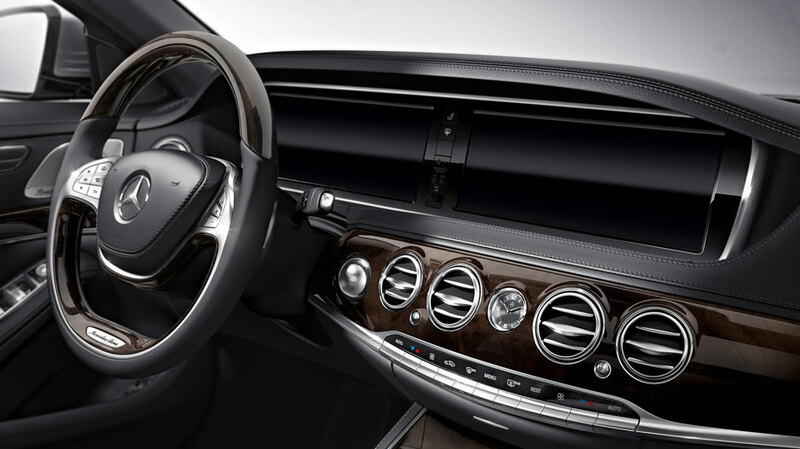 The moment you enter the S-Class, Near-Field Communication technology detects your smartphone and establishes a secure connection to the command center. The dual 12.3-inch high-resolution COMAND® screens display everything from rearview camera images, to Gracenote® album information. The in-dash DVD/CD player and SD card reader offer a choice of music mediums, while the range-topping AMG® S65 sedan takes in-cabin entertainment to new heights with a 24-speaker Burmester® High-End 3D Surround-Sound system for top-of-the-line sound quality. The ultramodern spirit of this legendary Mercedes-Benz sedan extends to its thoughtful cache of safety and security features. Active full-LED headlamps use Adaptive Highbeam Assist to adjust the intensity of the LEDs, while MAGIC VISION CONTROL® includes heated wipers for easy snow and ice removal. No matter the weather, the ESP® and Brake Assist work tirelessly to prevent wheel-spin, and to also apply maximum braking force when you need it most. ATTENTION ASSIST® and COLLISION PREVENTION ASSIST PLUS® come standard, while the apex AMG® S65 boasts an exclusive array of driver assist tech, such as PRESAFE PLUS®, Night View Assist PLUS, and more. The S 400 4MATIC® SEDAN boosts an impressive 329 hp, 354 lb-ft torque, 3.0L biturbo V-6 engine, along with a 12.6/8.6 L/100km fuel economy. The S550 4MATIC® Sedan swaps rear-wheel drive for 4MATIC® all-wheel drive, giving it the technology it needs to put the biturbo V8 engine’s 516 lb.-ft. of torque to work. This rugged sedan bares a close resemblance to the S550 in the sense that it brags many of the same features, including active full-LED headlamps and Near-Field Communication technology. The S550e Plug-In Hybrid generates a combined 436 hp and 479 lb.-ft. of torque, thanks to its 3.0L biturbo V8 engine and 80-kW electric motor. Equipped with a 4-mode selector – HYBRID, E-MODE, E-SAVE, and CHARGE – this luxurious plug-in nets the equivalent of a 4.4 city/3.7 L/100km highway rating in all-electric mode. 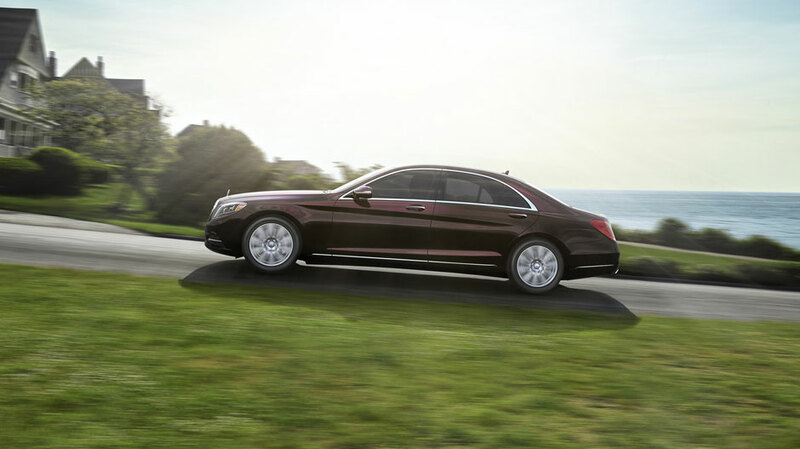 Motivated by a 6.0L V12 engine, the S600 Sedan generates 523 hp and 612 lb.-ft. of torque. Fully active MAGIC BODY CONTROL® suspension uses a camera to adapt to adverse road conditions, while the 12-way power and heated front seats let drivers cruise in comfort. Capable of reaching 60 from 0 kph in a matter of seconds, the AMG® S63 4MATIC® Sedan takes a level in power with a 577-hp 5.5L AMG® biturbo V8 engine. Engineered to adapt to your driving style, this dynamic sedan includes a 7-speed AMG® SPEEDSHIFT® MCT transmission with three selectable driving modes, and Adaptive Damping System PLUS with two modes. Reaching engine figures of 621 hp and 738 lb.-ft. of torque, the AMG® S65 Sedan wows with a 6.0L AMG® biturbo V12 engine. Exclusive AMG® V12 body styling and detailing gives the AMG® S65 a more aggressive look than its siblings, and includes large mesh air intakes, chrome accents, and more. Check Out the S-Class—A Short Drive Southeast of Orangeville! Come to Mercedes-Benz Brampton to see why the S-Class remains the flagship sedan of the Mercedes-Benz family! Conveniently located at 10 Coachworks Crescent in Brampton, we proudly serve car shoppers in Caledon, Georgetown, and Halton Hills. If you’re interested in booking a test drive in the Greater Toronto Area, contact our sales department Monday through Saturday!